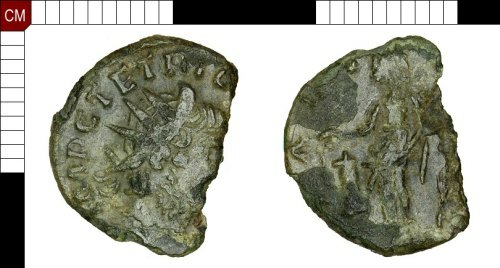 An incomplete copper-alloy Roman radiate of Tetricus I (AD 271-274), dating to the period AD 271-274 (Reece period 13). SALV-[S AVGG] reverse type depicting Salus standing left holding rudder and feeding snake rising from altar. Mint I. Cf. Normanby no. 1493.